An adventure for 6th-level characters. Publisher's blurb: "Deep in the heart of the city lies that strange edifice. Everyone knows about it or, that is to say, everyone knows it is there. No one ever really seems to have much more information about the granite structure, except that it has no windows or doors, and it is surrounded by swirling wind. Most people call it the Obelisk of the Winds. Tales are told of its secrets, but none of them seems to hold the truth. This urban miniadventure can take place in just about any city in your campaign - just set it in the part of town that works best for your current needs. 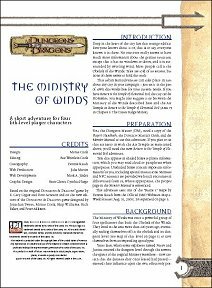 If you have Return to the Temple of Elemental Evil, the city can be Hommlet; you might also suggest a tie between the Ministry of the Winds described here and the Air Temple in Return to the Temple of Elemental Evil."